This article was originally published at PinkNews. TransBareAll are crowdfunding a project to produce support materials to prevent suicide. Please donate anything you can. I recently wrote about Trans “regret”, with sarcastic quote marks in the title to highlight that this mainstream trope is not supported by data. No such quote marks are required here, as the high rates of suicide are a very real and desperate situation for the trans community. I will again draw on data from the Trans Mental Health study to highlight the reality behind current stories in the media. I’ve been driven to write this post by the widespread reporting on the death of Lucy Meadows, a primary school teacher in Lancashire. I should say that at this point, there is no confirmation that it was suicide, but there have been informal reports on social media, and some bloggers have felt confident in saying that it was. The reason that this particular death is receiving widespread coverage, is that Lucy was the target of a vicious article in the Daily Mail just three months ago, covered in detail by Zinnia Jones (no direct link to the DM). Jane Fae wrote about the links between Lucy Meadows’ story and press regulation, which is high on the media agenda right now. In related news, this week the Press Complaints Commission responded to a selection of the 800 complaints they received about Julie Burchill’s transphobic rant in January. The PCC has ruled that the decision to publish was not in breach of the Editors’ Code of Practice, predominantly because the article did not name an individual. 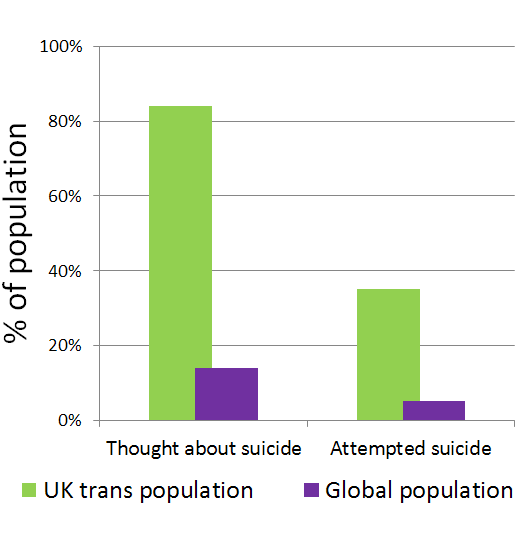 Bar graph comparing UK trans population, 84% of whom consider suicide, and 35% who make at least one attempt; with the general global population, of whom up to 14% think about suicide, and 5% make one attempt. We need to start helping trans teenagers. This would have helped me and probably prevented me from attempting suicide. If I had not undergone surgery when I did I would almost certainly have either been a suicide or at very least a long-term depressive and possible inmate in some mental hospital. ‘The ways trans people are portrayed in the media generally fosters negative views of trans people. It makes me feel unsafe because it normalises ridicule and violence towards trans people, portrays our identities as invalid, posits being cis as the ‘natural’, ‘normal’ way to be etc. The number of respondents for individual questions are lower than for the study as a whole, percentages given are of those that answered a given question. Full details are in the TMH report. I could not find figures for the UK but if anyone has some, please let me know! This entry was posted in Uncategorized and tagged gender, media, suicide, trans by Maeve. Bookmark the permalink.